Have your artificial grass installed now and pay nothing for 12 months! – Interest FREE! Interest free finance is a fantastic way to spread the cost of your purchase. Wonderlawn are now able to offer you a buy now, pay in 12 months option. It’s a simple way for you to have your artificial grass installed now and pay later, all with the added benefit of it being interest free. Choosing finance for your artificial lawn? Your application will be assessed based on various factors including eligibility, credit history and affordability and we will let you know the outcome of the decision, over the phone in just a few seconds. It’s important to know that when applying for finance a hard credit check is made and this is recorded on your credit file. Once approved, you just need to digitally sign your credit agreement, pay your deposit and then wait for your lawn to arrive. In a very few cases, your application may be referred to a lender for manual underwriting. In such cases you’ll be notified by email of the credit decision within 24 hours. If you’re not approved for finance, it could be for a variety of reasons. You should gain a copy of your credit file and this will be able to give you more information. You can buy now and pay in 12 months . You have the right to repay all or part of the loan early at any time. If you decide to not repay the loan in the 12 month period, you are then moved to our 4 year payment plan, where interest will be calculated based on the cost of your installation. There is a 14-day cooling off period where you can withdraw from the credit agreement after signing your documents. If you wish to do this, you need to notify us. A finance agreement does not affect our standard refund and returns policy. Just contact us and we can cancel your application. We will let you know of any outstanding balance if applicable. For any other questions contact us on 0333 700 6000 or via email. 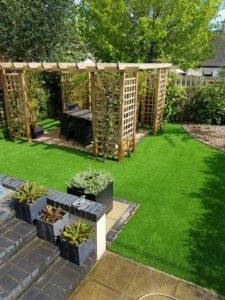 If you’ve read the above and feel a buy now pay in 12 months package is right for your artificial lawn installation, simply click the order button below and fill in the contact form or pickup the phone and call us on 0333 700 6000 to begin the ordering process. Decided on which artificial grass you’re interested in? If so simply give us a call on 0333 700 6000. If you’re still unsure, have a look at our grass range by clicking here. Free QuoteFree SamplesPay nothing till 2020!